Project Scope: The Oregon Coastal Quilters Guild is a group of dedicated quilters sharing the joy of the art form with others through shows, workshops, informational programs, and just good old-fashioned fun. With an extensive membership and community involvement the guild members create amazing quilts. This is a custom WordPress site designed using the	center piece of one of their award winning raffle quilts created by Dennis McGregor. We then modified it a bit adding the quild's logo to one of the sails and then creating the ocean and lighthouse and completed the design with quilt fats around the border to complete the design. The WordPress installation includes an event calendar, a full forum (bulletin board) and more than a few touches to add some elegance to the project. Design Components: New site design using one of the guild's award winning quilts. Graphic Editors: Adobe Photoshop and Illustrator. 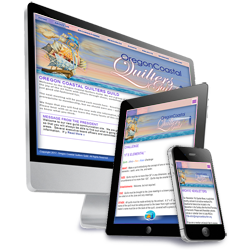 Responsive - Mobile Friendly: The site is fully responsive for PC, tablets and cell phones. Web Hosting: Powered by Vortices Design. For an free initial consultation call us toll free at 800.952.4182 or 503.521.6895.